There’s one place in all the world where all of the clothes were selected just for you. They are all your size. They are all your favorite colors. They are all the cuts and shapes that flatter you most. This place is, of course, your closet. If it’s NOT like this, you have clear-cut goals to achieve. And if it IS like this, why are you still out wandering around aimlessly, blindly, in stores that just don’t measure up to what you’ve already accomplished, all on your own? Perhaps THE most poignant and profound post ever. Why? Because we have acquired the contents of our closet haphazardly! That's why we are here–reading this blog! Thank you Janice! You pose a very good question. Why keep looking when we already have what we need? I have more than enough in my closet. I am trying to organize by colour as this is how I shop. Weeding the closet needs to be ongoing for me as space is an issue. I guess we really need to think of ourselves as "curators" of the closet, hanging each piece in the way that we can best appreciate it . Love this post…so much to ponder. Beautiful hangers! What kind and where to purchase? Best prices for bulk if I'm to replace a lot of them? I bought my hangers, in boxes of 6, from Bed Bath & Beyond. I started with just six, and put my blazers on them. They looked so nice that I bought ANOTHER six, and hung my cardigans on those. I finally went "full Joan Crawford" and bought 5 dozen at one time (cost as much, at that time, as a nice sweater). 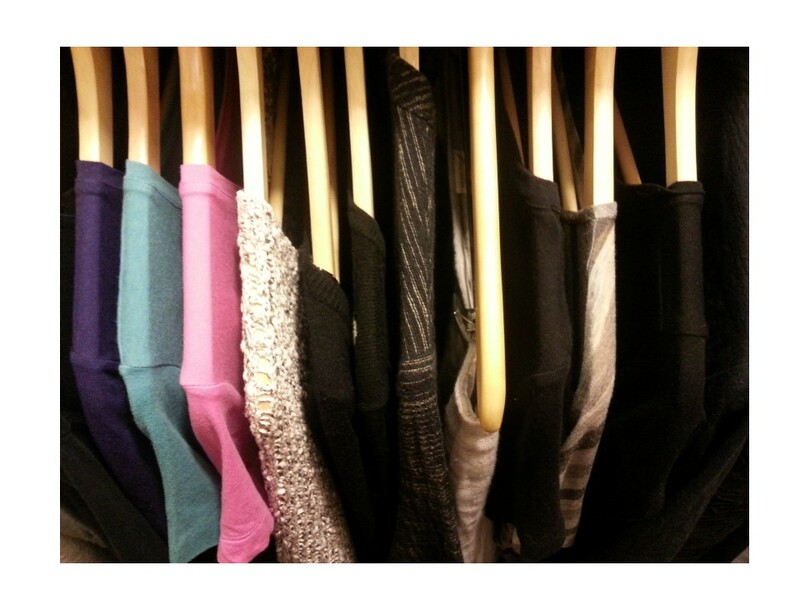 I've now had them for 10 years… With 60 hangers, I have a built-in limit to the size of my wardrobe! Ikea has some nice inexpensive ones called Bumerang. They come in bulk. I never liked plastic ones…too tacky and not strong. Funny, my kids call me "Mommy Dearest" because of my thing against wire hangers. Great post. Gotta due some more editing with this in mind. BTW, you hang your cardigans? Don't they stretch out? I have two sweaters that have to be folded; most of mine are light enough (and they get worn often enough) that they don't stretch out. My two really heavy, loosely-knit pieces would be 5 feet long within 24 hours if I left them on a hanger! FInally – a reason to save those BB&B coupons! Thanks! A lot of it has to do wth the messages of perfection we buy, along with the clothes. We are told to strive for the perfect closet, the perfect body, the perfect house, etc. Why isn't a bit of jumble and a few errors amid workable things good enough? Why aren't •we• are good enough? Entire industries depend on keeping us insecure and scared and therefore, repetitive consumers. Thank you for your blog, which challenges that thinking. My comments keep getting posted twice – strange. I agree with VPL. This is a very important post. I do love all of the things in my closet and I do not need to keep shopping but I do. I have decided not to shop for a year. I was trying not to shop "as much" but that is a little wishy-washy and I need stronger boundaries. I think there is this fear that the perfect something exists and if I don't buy everything that might be perfect, I will lose out on the chance to own it. What a great inspirational post Janice! The title says it all. When I look at my closet I see some definite home runs and then I see…some absolute disasters. I suppose the problem is that I wait until the last minute to shop so this year I started early – checked out what was in the stores and then tried to develop a "plan". But here is my question – what do you do when you've got your basic neutrals figured out and have decided on your accent "colors" and then you go shopping and can't find the pieces you need in the colors you have chosen and you need those garments ASAP? I kept running into this same problem myself. My solution has been to go back to sewing and to do more garment-knitting. I can usually find fabric and yarn in the colors I am looking for. I have the same problem. And sewing doesn't help because I can't find the fabrics in those colors either. Nancy, this sounds like the way I think — and at least for me, I think the problem is that I want to go from my current slapdash wardrobe to a "perfect" wardrobe IMMEDIATELY. In reality I can wear my current clothes while I'm looking for and picking up the items I've identified that I need for the wardrobe I want to have. More importantly though is getting RID of the things that are disastrous and focusing on what DOES work. I love the idea above of not buying anything for a whole year; I may have to try that too! I suppose it does depend on the colors you are searching for. One thing that has helped me tremendously is to subscribe to fabric swatch services from Vogue Fabrics Online and Sawyer Brook. They send out seasonal swatch books containing different fabrics that coordinate. Not every one they send out has colors I am interested in, but it is worth it for when they do send out my perfect neutral or accent color with coordinating print. Finding certain colors is not the only reason I've gone back to sewing. I have become extremely picky about fit and many items in the stores just do not fit as well as I would like. Janice, love your blog and good luck on your new venture! I love this post! I almost stopped in a clothing store when I had a spare hour the other day, and realized (thanks to you), that I really didn't need – or even want – something new. It was just a habit. That's a great idea…turning a closet into a boutique. So one can pretend to shop. Sounds like fun! Love your style. I am fashionally challenged, and am looking for some ideas. A fabulous wardrobe is not in my budget, so I'm building slowly. Thanks for the ideas!